The app is available on Apple App Store for $0.99 and will be released soon for Android devices as well. 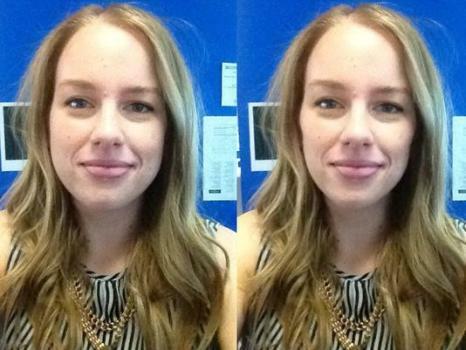 The new selfie-editing app, SkinneePix is designed specifically to make you look skinnier in your selfies. The app promises to make it look like you've shed 5, 10 or 15 pounds with just the click of a button. SkinneePix app only works for single shots and not group shots. Users can click photos from both the front- or rear-facing cameras on the smartphone or import images from their camera roll. The app uses facial-detection software and shaves pounds from the face and not the whole body. A little bar pops up under the photo which gives you four options to loose weight in your selfies: 0, 5, 10 and 15 pounds. The description reads: "helps you edit your selfies to look 5, 10 or 15 pounds skinnier in two quick clicks on your iPhone. SkinneePix makes your photos look good and helps you feel good. It’s not complicated. No one needs to know. It’s our little secret." The app has been developed by Susan Green and Robin J. Phillips of Pretty Smart Women in Phoenix. Green and Phillips stated that they came up with the app after discovering they hated all the selfies they took on holiday with friends. Green stated: "You've always heard about the camera adding 15 pounds, we just wanted to level the playing field." The app can be downloaded from the Apple App Store for 99 cents. The creators stated that an Android version of the app will be launched later this month. which smartphone is best in look (UI) in 2014 ?